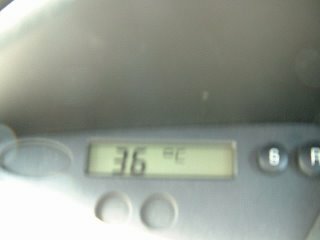 I know it's a bit blurred - but I just wanted you to see how bl**dy hot it was yesterday, and they are saying it's going to get even HOTTER today - PHEW! This was taken in my car around 1:00pm, and it remained at this temperature for about 3 hours. I think last night was one of the most uncomfortable of my life, even though I had a fan going in the bedroom ALL night, and lay on top of the bed. ...I shouldn't have abbreviated my user name !!!!! !